Douglas Lake is rated as one of the top 10 in the country for Bass Fishing and in the top 5 for Crappie Fishing. The lake covers about 34,000 surface acres and fishing is good generally year round. Fish species inhabiting the Douglas Lake include, Bass, Crappie, Catfish, and Bluegill. The best early season action occurs in April and May, with October, November, and December being prime time for late season fishing. During the summer months of June, July & August, action can be excellent at night, fishing for Largemouth Bass, Smallmouth Bass, & Crappie. For Bass, Carolina Rigs & Texas Rigs are very productive. Douglas Lake has some cover, but structure fishing is the key to this fishery. Night fishing, is best on calm evenings using buzz baits or large spinner baits. Any area with dock lights or nights of the full moon can be especially productive. 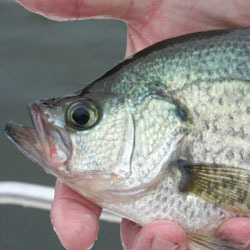 For Crappie, try tightlining or trolling minnows around main channel and creek channel flats or fishing the available cover in the area. The key access points for Douglas Lake are located in Sevierville, and Dandridge, Tennessee and include; Mountain Cove Marina, Light House Marina, Gator Point Marina, The Point Marina, & Swanns Marina. Come to the Smoky Mountain Region and enjoy the great fishing East Tennessee has to offer. Other lakes in the area you might want to fish while visiting include Cherokee or Norris lake, which offer great smallmouth bass fishing from October thru April, or fishing at night during the months of June, July and August. One of the most productive waters in east Tennessee. Largemouth bass draw the most attention. Douglas Lake also contains healthy populations of catfish, crappie and bluegill. 30,400 acres. Each detailed map provides depth, contours, structure, boat ramps, and updated fishing information. Douglas Lake fishing maps also include lake info such as gamefish abundance, forage base, water clarity, weedline depth, bottom composition, complete latitude/longitude grid lines and dozens of GPS waypoints & coordinates.